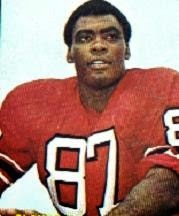 Following a college career that was capped by receiving All-American honors in 1967 from The Sporting News and Time magazine, Humphrey was chosen in the first round (third overall) by the Falcons in the 1968 AFL/NFL combined draft. He moved directly into the starting lineup and made an impact with his skill as a pass rusher. Falcons went 2-12 to finish fourth in the Coastal Division of the NFL Western Conference. Humphrey continued to develop in 1969, receiving second-team All-NFL honors from NEA and UPI, and was chosen to the Pro Bowl for the first of five straight years in ’70. He was a consensus first-team All-NFL selection in 1972 and ’73. Humphrey missed only two games in his first seven years, but lost all of 1975 due to a major knee injury. He came back in ’76 to achieve an unofficial career high in sacks with 15 and was back in the Pro Bowl in 1977, a season in which the Falcons defense excelled and gave up just 129 points. However, four games into the ’78 season Humphrey abruptly retired. The Falcons traded him to the Philadelphia in the offseason, and he came back with the Eagles to play another three years that included a NFC Championship in ’80. Utilized as a pass rushing specialist in his last two seasons, he was credited with 14.5 sacks in 1980. Overall, he played in 171 games over 13 seasons and, while sacks were not yet officially compiled, he was unofficially credited with 122 over that time. In addition to twice being a consensus first-team All-NFL choice, he received at least second-team or all-conference selections after six other seasons and was named to the Pro Bowl on six occasions as well. Humphrey was inducted into the Pro Football Hall of Fame, Class of 2014.